I remember hearing once, long before computers became so popular, that they would become so fast and powerful, with a storage capacity and connectivity, that we would essentially live in a paperless world. And so here we are today, in a world dominated by computers of all shapes and sizes. Computers are so common now that, if we know someone who does not have one, we are mystified how that could even be possible. But the promise, or prediction, of the paperless world has never come to pass. If anything, the commonality of computers has only increased our need for paper. Be it for documents or pictures, printers of all shapes and sizes can be found plugged into most computers, whether using a direct USB connection or over a local area network. I have reviewed a fair number of printers, so I am pretty qualified to help you identify ones worth your hard earned money. 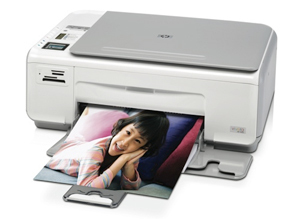 As such, let’s look at the very affordable and versatile HP Photosmart C4280, an All-in-One printer that sports a low price with the ability for very good quality ink-jet photo printing. Heck, if you have photos on a digital camera memory card, you don’t even need to connect the C4280 to a computer to print your photos. First, let’s look at the specs. The C4280 is both a Macintosh and Windows compatible printer. It can print, scan, copy, and act as a digital card reader. (For the later, it is best to connect to a USB 2 port.) The included software on CD includes the HP Photosmart Studio, a decent photo management application. In truth, I spent very little time using this application. Like more and more Macintosh users, I use iPhoto for photo storage management, although the HP Photosmart Studio does have other features iPhoto does not. The ability to order prints via the software with Snapfish is nice, although why anyone would need to with the printer is a little mysterious. However, you can use it to share your photos online, much like .Mac in iPhoto. It also does Slideshow, can burn a photo CD, can be used to stitch photos together, and even simple editing functions. As I said, it is a decent program, although I doubt most Mac users will ever bother using it. It does have a built-in software update check, which allows the user to make sure their software is the most current. Mine is, even after months of using it. Does not look like HP is updating the software much. Of more importance is the HP Device Manager, another HP program installed during set-up. This is the application you will interact with the most, especially if you plan on scanning pictures or documents into your computer. Scanning is done via the flat-top scanner atop the C4280. Place a photo or document on the glass, press a button, and your photo will zap to your Mac. One of the options here is “Scan to OCR” using the I.R.I.S. software. Unfortunately, for me at least, it never worked at all. Every OCR scan I tried came out as jumbled text. Scan Picture, however, worked just fine. Here you can choose where to send your graphic / picture, including sending it to iPhoto or the desktop. You are only presented with “Lowest” to “Highest” quality of your scans, so you cannot specify, for instance, that you want to scan at 600DPI. This is a limitation in the software, not hardware, and other All-in-Ones in the same price range do give you much better options. In fact, scanning a picture at the “highest” setting as a tiff only resulted in a 200DPI image. Sorry to say, that is both poor and unacceptable. If anything, the minimum “Highest” setting should yield a 300DPI image. Printing color photos on HP approved high-gloss paper yields a decent, if not great, picture. The Lexmark I reviewed eighteen months ago in the same price range printed better looking color images, and was faster from start to finish. This HP printer has a built-in 1.5″ (small) color LCD that can be used when the printer is acting as a stand-alone product. (Such as printing pictures from a digital memory card.) While this is fine if you want to print just one picture, the interface is clumsy and not intuitive. HP is known as the go-to company for printing. While the C4280 does a decent job on all its functions, none stand out as great. Printing quality, I had hoped, would be the saving grace. It is not, doing only an average job as other printers in this same price range. Scanning is limited by poor software. And the card reader is just that, a simple card reader. MyMac.com rating: 3 out of 5. The price is right, the quality could be better. Just an average, nothing special All-in-One that refuses to stand out in a crowded market.